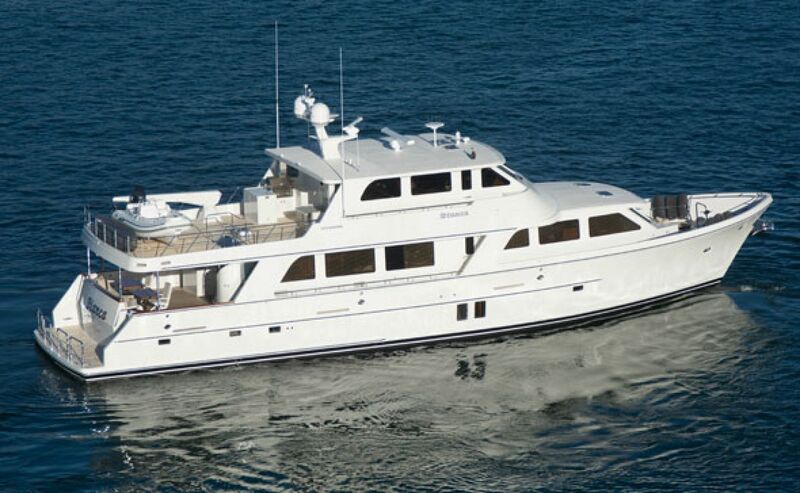 When I was assigned to test the Offshore 87 Motor Yacht I was momentarily stumped. I knew the name and was aware that Offshore builds serious long-range cruisers, but I couldn’t call to mind a specific model. Nor could I remember ever actually being aboard one, which, considering the time I’ve been doing this job, is a bit out of the ordinary. I suspect I’m not alone. 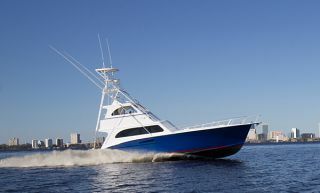 A lot of boaters may be unfamiliar with Offshore because frankly, the company isn’t terribly aggressive about getting its name out there. Oh, you’ll see them at all the major boat shows, but compared to the heavy hitters in this category they’re definitely the quiet guys. Which is ironic because by any measure Offshore is an uncommon success story. It’s been building bluewater cruisers continuously since 1983, and today some 360 of its vessels are cruising the world’s waters. 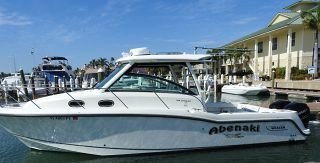 While perhaps not a household brand among most boaters, Offshore is known and respected by captains and knowledgeable brokers, and many of its buyers are repeat customers who have logged hundreds and even thousands of hours at sea on their boats. Being innately conservative—if not downright stodgy—Offshore has never followed trends. The boats don’t change very often, and when they do change they don’t change much, and the company can get away with that because it got the basics right. 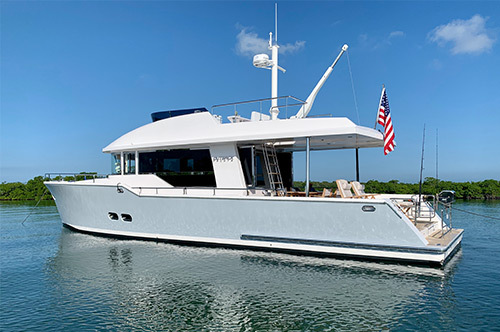 The hullform is essentially the same for every boat in the line, from the 52 to the 90, and that includes the subject of this article, the new 87 Motor Yacht. 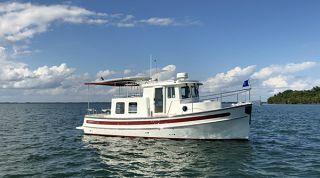 The shape is the creation of William B. Luther, a naval architect who apprenticed under the revered Bill Crealock, and the core elements are a fine and unusually deep forefoot, a modest (for its LOA) beam, and a warped running bottom. Specifically, forward convexity transitions into aft concavity, which the designer says “plants” the boat in the water, meaning tracking and stability—especially at anchor—are enhanced. A three-quarter-length keel also helps impart directional stability but since the forefoot is so deep, it doesn’t have to be as large as you’ll find on cruising boats of similar LOA. That reduces wetted surface and so improves efficiency. Offshore says that all these components work together to create “the softest ride on the water,” a claim that’s impossible to verify. But I did take the 87 out in steep 3- to 4-foot chop and was impressed by the total lack of jarring, to say nothing of pounding. It was a very smooth ride, especially given the speeds we recorded. You probably expect the 87’s hull to be either displacement or semi-displacement but in fact Luther says it is a planing design, which explains a top speed of 16.4 knots and a fast cruise (at 80-percent load) of 13.2 knots at 2150 rpm. To go along with this speed the 87 offers excellent range at all speeds thanks to generous fuel tankage. 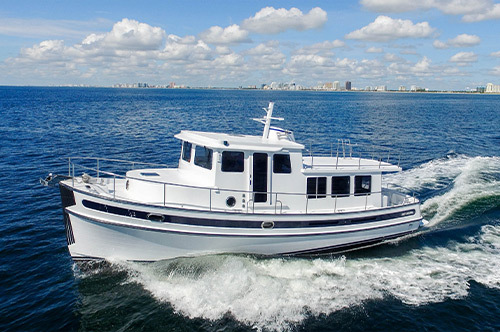 Our test boat’s optional 500-gallon fuel tank under the swim step gave her a total capacity of 3,600 gallons, and while this is divided among a total of six tanks, Offshore has designed the system so that no manual fuel transfer is necessary; everything is gravity-fed. 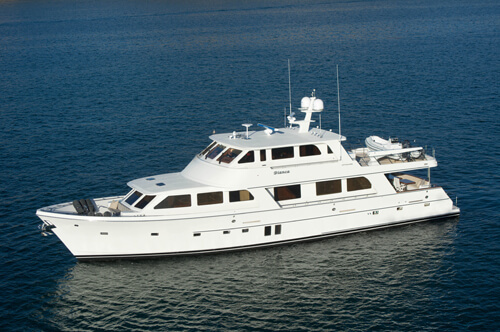 Consequently the 87 has a range more than 600 miles at her 80-percent throttle setting. That’s a more remarkable figure when you consider this boat’s heft. 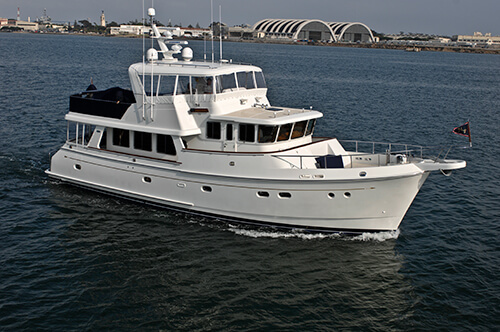 With a dry weight of 194,000 pounds, the 87 is no lightweight, nor was she intended to be. Construction, which takes place at the Kha Shing facility in Taiwan, involves a conservatively built hull of solid FRP below the chine and Corecell coring above it, as well as in all deck and superstructure components. The Corecell is used more to produce a flawless gelcoat finish than to save weight, and it shows. A number of feature lines break up the expanses of mirror-like finish. Still, modern lamination methods are employed with an aim to produce a strong and solid structure. All cored laminates and many small parts are vacuum-bagged; the hardtop, hatches, cabinets, and doors are infused. Every component benefits from the use of top-quality lamination materials, including Cook gelcoat, Hypoint 90 catalyst, Cymax bidirectional and unidirectional fabrics, and vinylester resin for outer laminates and isophthalic resin for inner laminates. The result is a solidity that’s palpable, a sensation that’s enhanced by the standard Seatorque drive system, which transfers propeller thrust to the hull instead of the engines. 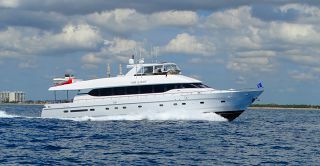 Most of everything I’ve written so far applies to every Offshore in the line, and yet the 87 Motor Yacht differs from all of her sisterships in one significant way: styling. Every other Offshore exhibits the square-ish profile, complete with Portuguese bridge, that is something of a passagemaker trademark. While the 87 has the high bulwarks and protected side decks that mark her as a boat that was designed to go to sea, her lines are more sculpted and flowing. The Portuguese bridge is gone, and the roughly 7 feet or so of deck that it occupied has been added to the now-enormous bridge, which sits well forward to provide superb forward sightlines. 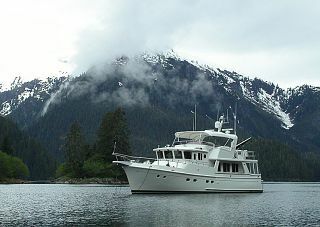 And while all Offshores are designed to be amenable to customization, the 87 is truly a semi-custom vessel. 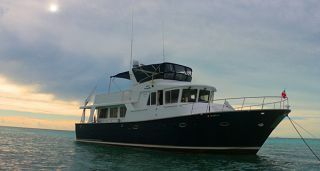 The standard layout is a three-cabin, three-head design: a full-beam midship master with private companionway, forepeak VIP, and large guest cabin to port with athwartships single berths. 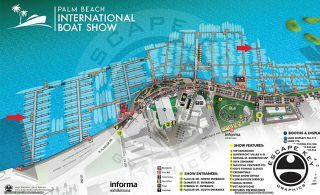 A four-cabin version is also available, but the layout of our test boat illustrates the kind of flexibility Offshore offers its customers. One of the owners wanted more hanging-locker space and a second washer-dryer set so she wouldn’t have to trek all the way aft of the engine compartment to the lazarette/crew’s quarters to use the standard pair. 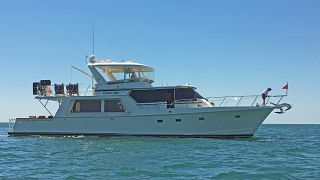 Offshore accommodated her by pushing forward the starboard bulkhead in the master head and changing what is normally the head for the guest stateroom into the space she desired. It then reconfigured the guest stateroom into a smaller space, which is fine since these owners rarely travel with two couples. That kind of flexibility, along with proven long-range capability, is what makes Offshore’s customers happy. It’s a good thing too because this builder’s forte is definitely not promotion and pizazz, but performance and prowess.